My collection of unwatched DVDs is getting out of hand! I now have a whopping 274 movies in my collection that I haven't watched yet. At least not since getting the DVD. There may be a few in there that I saw before getting the DVD. But I never seen since getting it. As usual I am going to list below my Unwatched DVD Collection... This is my complete unwatched DVD collection. Including horror movies... which I will not watch until October... as well as the movies that is in the packages I am expecting. Since she told me her receipt says it should arrived today I figured it was safe to add them. Figuring even if they don't arrive today... they will most likely be here before the weekend is over. Please feel free to suggest/request any you want me to review... I will try to get to them before the weekend is over... though I can't promise. Meangirls? oh you must be talking about Mean Girls! That one is in the box I am expecting... but I am pretty sure it will be here in time for this weekend. In all serious, Mean Girls is a cracking film. Clueless for the 00's. All those are in that package that is on the way. Hopefully they will get here before Monday. I just checked the tracking... and it is in town now! It will be here later today! I loved Mean Girls when I last watched it. That's where I discovered Rachel McAdams and I've liked ever since! Of course it also stars pre-excentric LiLo too.. still good looking at that time! I will have to be sure to check it out this weekend. Before that she was in the first season of Slings & Arrows, the best Canadian TV show that I know. Sadly, she left the show after becoming famous with Mean Girls in the US. I just checked profiler. Mean Girls will be the first thing I have with Rachel McAdams. and if you have time, the Star Wars Trilogy. Or you could make a separate mini-marathon out of this. I am up in the air about what to do with Star Wars... to watch at least some here... or save it for a marathon of it's own. I keep going back and forth on it. Jamie Foxx (Collateral) stars as the one-of-a-kind innovator of soul who overcame impossible odds to become a music legend. 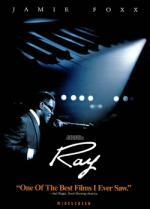 Ray is the triumphant and remarkable story of one of America's true musical geniuses, Ray Charles. From his humble beginnings in the South through his meteoric rise to the top of American music charts, Ray's inspirational journey is a tale of hope, redemption and the power of the human spirit. "Ray is Electrifying" hails Peter Travers of Rolling Stone. Witness the incredible true story of a musician who fought harder and went further than anyone could imagine. Ok... what to say about the movie. First let me say... wow.. this one has a lot of music in it. Made it impossible to just ignore the music like I can normally do. Which kinda sucked for me... because the movie can't change how I feel about music. It is what it is... and there is nothing I can do about that. Now the story on the other had I enjoyed very much. Such a detailed look at his life... both the good and the bad. Instead of starting the movie from the beginning and going in chronological order (which I normally prefer) this movie uses flashbacks. I normally don't care for flashbacks because they can easily make a story confusing. But in the case of Ray the flashbacks works extremely well and I think makes a more powerful movie. I've only known Jamie Foxx as a comedian... but I must say he impressed me here. I thought he did a wonderful job in the title role. I find it hard to believe that I am saying this... but this is one musical I am glad I have in my collection... and yes... I can see myself watching it again. So there you go... a surprise for both of us. A surprise for you all that I actually watched a musical... and it being the first one in my marathon. As well as a surprise for me as I enjoyed it much more then I thought I would.